The lyric video of Bryan White's God Gave Me You has been viewed more than 20 million times on YouTube since it's upload in July 2011. Thanks to the #ALDUB phenomenon! Only in November 2015 that Bryan White made his own video with mentions of #AldubYou and #AldubNation written on a white paper. 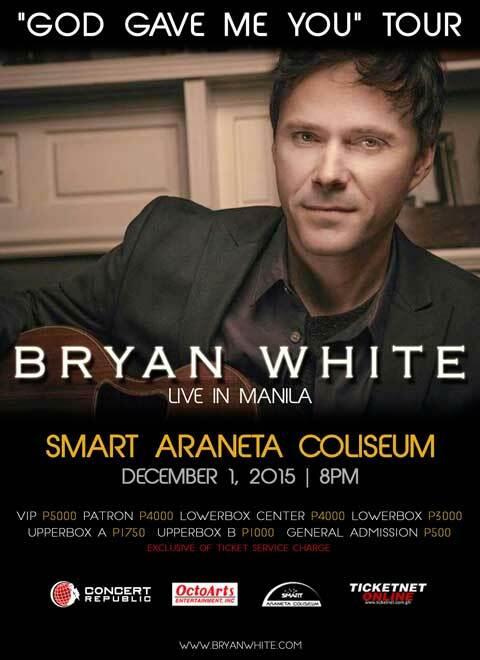 In a related note, Bryan White performs live in concert entitled "God Gave Me You Tour" at the Smart Araneta Coliseum on 1 December 2015. If you would search "bryan white concert philippines," Google will give you 437,000 results. This means that his concert has been mentioned around 437,000 times on different sites on the Internet. Image results would show at least 47 results of the concert's poster. That just proves how hot the song is this 2015 even if, originally, the song was released in 1999. This is the video that has been viewed more than 20 million times. Another lyric video by 09joanne has been viewed more than 15 million times. Alden Richards recorded recently his own version produced by GMA Records. In his album Wish I May released in October 2015, God Gave Me You is one of the 5 tracks. For the first time, Alden performed this song live on Eat Bulaga. If you are interested to watch Alden's very emotional performance, watch it here. During her Silver Anniversary concert in November 2012, Regine Velasquez performed for her son Nate her version of God Gave Me You. October this year, Universal Records released her version of the song on its YouTube channel.